Have I mentioned lately that I’m not the sharpest tool in the shed? 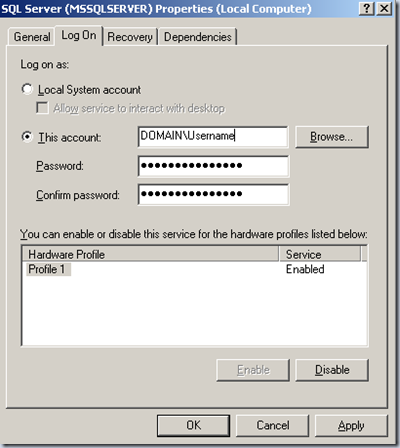 It seems I was brilliant when setting up my SharePoint VM and I used my user account when setting up my VM’s service accounts. Smart move? right? At least I won’t forget what username and password I used. Well…. pretty stupid actually. My password changed on my user account which broke SharePoint on my VM. I couldn’t access any of the sites or Central Administration. Actually, I knew this was going to happen, I was just procrastinating worrying about it, but HEY it gives me an excuse to learn something new! So, the question becomes, how do you change the passwords for your Service Accounts so things start working again? Woah.. slow down there slugger. First thing you need to do is change the password associated with your SQL Server Service, otherwise you will get the ever so helpful and annoying error message “Error updating the administration application pool credentials.” when you try to update the passwords. I LOVE SharePoint error messages. Actually, you don’t have to worry about this if that service account password did not change, but I was smart and used the same user account for all of them. 4) Change the Password click on “Apply” then start the Service. 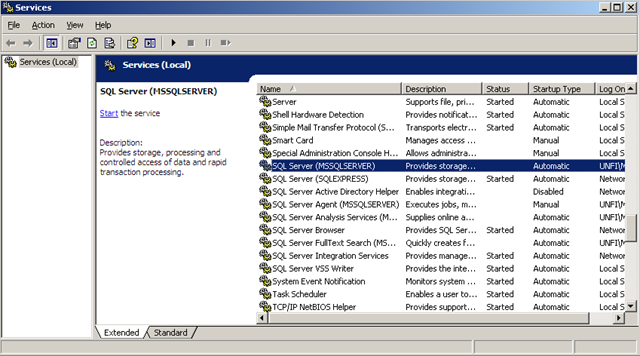 There you go, your SQL Server Service is now started, and we are ready to change the Service Account Passwords. Just copy and paste the script, change the Doman, usernames, and passwords to be what they should be and run the script! Super easy, very awesome. I was so happy I had to write a blog about. So, there you go. Again, nothing too earth shattering, but hopefully helpful nonetheless. The POSM (Plain Ole Service Manager) is not what you use. 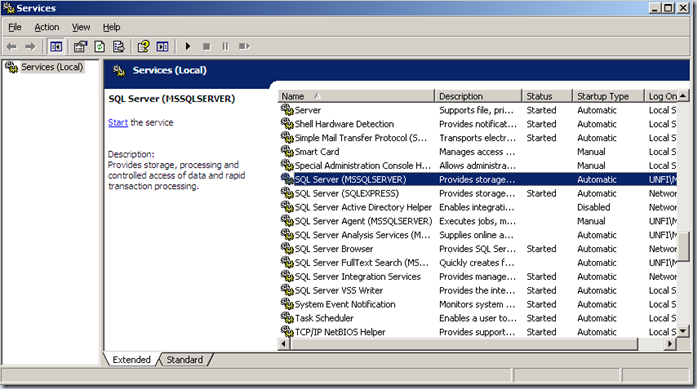 Do use the SQL Server Configuration Manger either directly from the SQL Server start group or though your services folder of Manage Computer (the SSCM will be at the bottom). 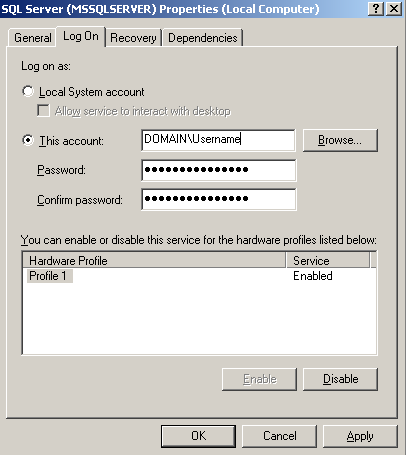 Account changes made though this method perform additional functionality like checking service logon permission, etc... that the POSM service control interface does not.